The process of painting pressure-treated wood involves steps you would not take—and considerations you would not make—with regular lumber. Here's what you need to know. It’s a two-sided coin: Painting pressure-treated wood comes with complications caused by the very same treatment that allows the material to last outdoors. To produce pressure-treated wood, the milled lumber (typically pine or cedar) is saturated with chemical preservatives. 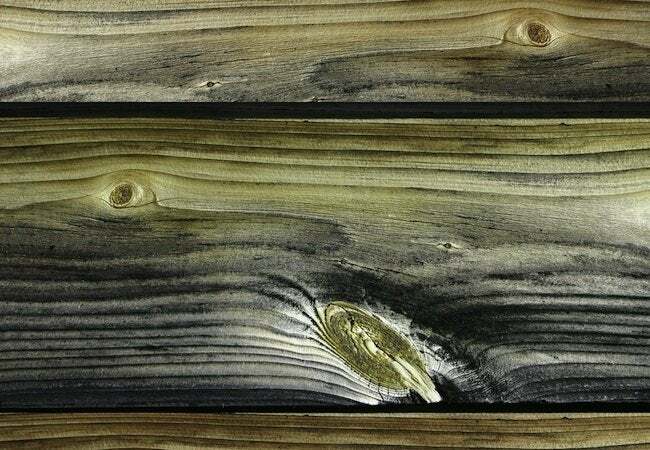 These chemicals minimize the wood’s natural vulnerability to insects and rot, but they also leave the wood rather wet—a state that will ultimately lead to your coat of paint eventually peeling. To paint pressure-treated wood successfully, therefore, you must be prepared to exercise a bit of patience. Painting before the wood’s ready simply wastes a day’s effort. For lasting results, follow the instructions below. Apply initial coat of paint. Apply top coat of paint. For full project details on how to paint pressure-treated wood, continue reading below. First, before painting pressure-treated wood, it’s important to clean it. Use a stiff-bristled brush and soapy water. Once you’ve given due attention to the entire surface, rinse off the wood and allow it to dry thoroughly. Between the chemicals used to treat the lumber and the water used to clean it, the drying time may be as protracted as a few weeks—or even a few months. How do you know when it’s ready? Once the wood feels dry to the touch, sprinkle a bit of water on it. If the water soaks in, then the wood can be painted. If the water beads up, go back to playing the waiting game. Note that for a time-sensitive project, it may be wise to choose pressure-treated wood marked as having been kiln-dried after treatment (KDAT). The timeline for painting KDAT wood is considerably more condensed. Only once you’ve confirmed that it’s dry can you begin painting pressure-treated wood. Start with primer formulated for exteriors, and make sure that the manufacturer lists the coating as suitable for use on pressure-treated wood. Note that, while priming and painting pressure-treated wood may be easiest with a paint sprayer, opt for a brush (or use both in combination) if the job entails detail work. Having primed the wood—and having allowed sufficient time for the primer to dry (it should take no more than a day)—move on to applying your top coats. You should expect to do two. Avoid using oil-based paint here; on pressure-treated wood, latex performs much better. It’s worth mentioning that in outdoor applications where the finish will be subject to the elements, paint lasts longer on vertical surfaces like fences than it does on horizontal ones like decks. If you don’t like the idea of repainting every two or three years, consider staining the pressure-treated wood instead. Yet another option is to allow the wood to weather and become gray, and then to coat it with a protective sealant. Of course, sealant must also be reapplied, but many consider the job to be less demanding than repainting, which often entails scraping away parts of the old finish.